15. 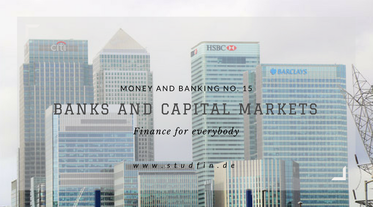 Banks and Capital Markets - Studfin - Einfache Geldanlage! "What is the Volcker Rule? - A federal regulation that prohibits banks from conducting certain investment activities with their own accounts, and limits their ownership of and relationship with hedge funds and private equity funds, also called covered funds. The Volcker rule’s purpose is to prevent banks from making certain types of speculative investments that contributed to the 2008 financial crisis." The banking system has evolved, we are no longer living in a world, where banks only collect money from their customers and give away loans. Banks became an important intermediary for different purposes, which made them more profitable but they should be watched carefully, otherwise, we could slip into another financial crisis. Banks are necessary because they close the time gap, store our money and provide us with liquidity when we need it. Everybody owns or need money at different times. Banks can close this time gap, by giving everyone what they want and they help to distribute the wealth so the economy can grow (Adam Smith/Article: "Why do we need banks"). If the rich people would hoard their money, companies can not borrow money to make investments that are generating cash flows in the future or entrepreneurs could not start their companies. A big chunk of money would rotten at the bank accounts of rich people because they do not need it most of the time. Therefore banks are important intermediaries to distribute this wealth. As we already know banks borrow short by getting deposits and lend long by giving away long term credits like mortgages for houses. This is how they made good profits for a long time. Even though they make money doing that it is not a "free lunch" (Financial slang for getting something without working or taking risk), because they are facing liquidity risks. If too many people withdraw their money and they will become illiquid because the banks would only have mortgages but not enough money. We know that banks can create deposits and give away loans even when they do not have enough dollar bills, (Article: "How banks create money out of thin air") but if people want to withdraw too many dollar bills, banks get into trouble. They can handle this risk because they know that they can borrow money easily either in the repo market or from the Fed (Article: "Fed Funds" and the "Repo Market". Banks do not only have risky long term assets like mortgages, they also have "risk-free" securities like treasury bills, which are considered risk.free, because they are backed up by the government. If one bank becomes illiquid because too many people are withdrawing money they could take some risk-free assets like treasury bills and use them as collateral (dt. Pfand) to borrow money from another bank. Banks owned risk-free assets because they could always liquidate them. At one point they also started to use riskier assets as collateral like (corporate) bonds. That was also the time when rating agencies were established, so banks knew how to price bonds more accurately and how much risk would be involved in taking that bond as collateral. That was around 1918 when Harold Moulton set liquidity equal to "shiftability", which rates how liquid the markets are -> how easy or difficult it is to sell assets. Of course having a normal bond as security carries more risk, because especially in times of crisis it is hard to use nontreasury bills as collateral because no one has enough liquidity to discount your bonds and is afraid that the bonds are going to lose value, because companies credit risk rises in times of a crisis. The bond lose value in times of crisis because there is less money in the market to buy bonds, so the demand is lower and the credit risk is higher, which pushes down prices. Why do banks buy "normal" bonds? Because they are more profitable! From now on capital markets were established. They consist of debt instruments like government bonds (treasury bills), corporate bond and equities (stocks). They are not separate from each other. The capital markets are giving the banks the opportunity to change their assets (bonds) into cash. Before that riskier capital markets and banks were separated but now both is mixed. The bank does not only use bonds as collateral but acts as an intermediary as well. They give us the chance to hold corporate, government bonds or equities. Not only banks act as intermediaries, pension funds who are holding money and buying stocks or insurance companies holding policies and buying bonds act as intermediaries. As we see liquidity is not the main problem of banks, even though liquidity kills you quickly. The problem arises when a bank becomes insolvent, so their liabilities are bigger than their assets and that is the point where not even a central bank should rescue a bank. Of course, that is a harsh statement and I know that the customers of the banks and their employees should be protected but if banks know that no matter what they do they will be rescued, they will take too much risk to earn higher profits and we could rush into another financial crisis. In conclusion, we can say that the old business model of collecting deposits and give away loans was not that risky but entering the capital markets and start trading and holding risky assets that could lose its value quickly made the situation unstable and is one of the reasons for the financial crisis. Financial Times Quote, which is for once a quote from Investopedia.com shows that the banks interacting in the capital markets can cause an unstable environment and need regulation. Even though these regulations exist banks are still allowed to do market making, underwriting, hedging, trading of government securities, insurance company activities, offering hedge funds and private equity funds, and acting as agents, brokers or custodians as long as these activities are not conflicted with their customer's interests. I know that these topics are quite complex so if you don't understand this article you are welcome to ask some questions or go back to the earlier articles.